I’m a sucker for good packaging. When it comes to packaging, for me, it’s in the details. The quality of any item is instantly elevated when you have good graphics and a pretty package. It is my opinion that anticipation is the best part, gift wrapping adds a special part to that. For the style of packaging I prefer repurposed, hand wrapping, and a touch whimsy with a historical feel. And if I am being honest, even if it’s just the illusion of those things, it’s good. If I personally purchased an item and it arrives prettily packaged it feels special. Like I received a gift from the seller, not just a product. Good packaging also encourages me to purchase from the seller again. 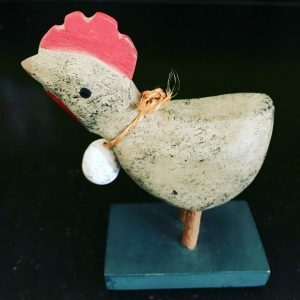 Susannah’s Kitchen on Etsy is really good at packaging. I love her aprons and wear one most days, I’ve ordered no less than 5 aprons from her, the product is good on its own. The aprons arrive perfectly pressed, are handmade to order, and each package comes in a uniquely sized box and that is wrapped like a gift. But truly, I’m telling you, every detail is pure perfection. I wish I had photographed one when I opened it to share the magic with you. Not only do I like to receive good packaging, but I like to create good packaging. Recently I shared my Halloween goodies that were handed out at Trunk-or-Treat. These are a great example my joy in creating good packaging. And, I theme never hurts. 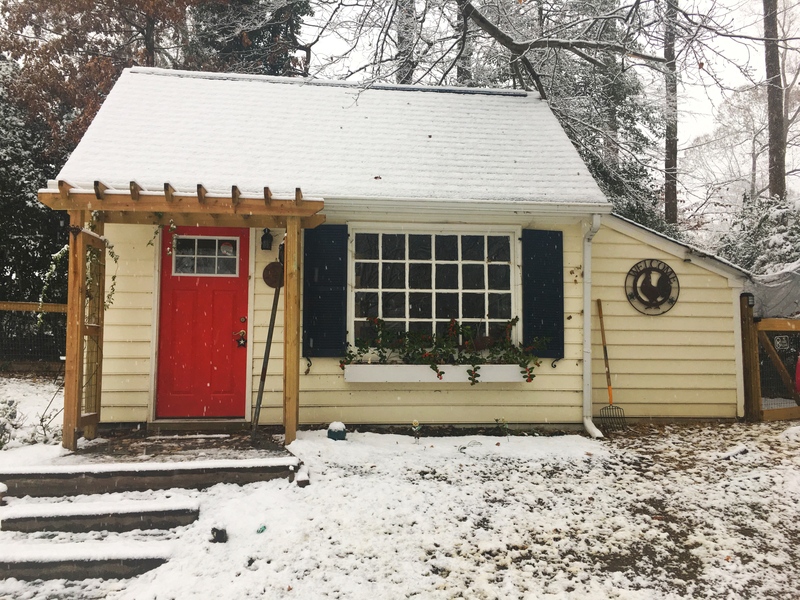 We had our first snow of the season last Sunday. It didn’t begin to stick until we had a few inches. So even though we had about four inches it was rather sparse on the ground. It was still beautiful. 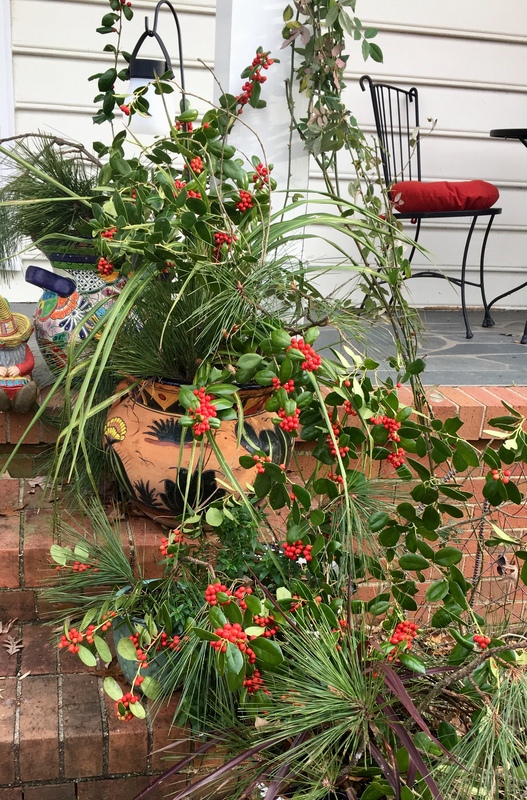 The previous day Chuck had trimmed some holly bushes and I used the trimmings to add into the pots and window boxes to bring some Christmas cheer to the curb appeal of our house. I knew I wanted to add some pine branches in and I considered picking some up when we were at Sam’s Club but I really didn’t want to pay for them. We have many Pine trees in the neighborhood and I thought I might ask one of the neighbors if I could trim some branches from theirs. As luck would have it, with the weight of the snow there were several downed branches from pine trees laying around on the sides of the road. Tim and I stopped and pick up several of the smaller ones. I popped them in the pots with the Hollys and I love how they look. Let’s talk about a different type of snowflakes. 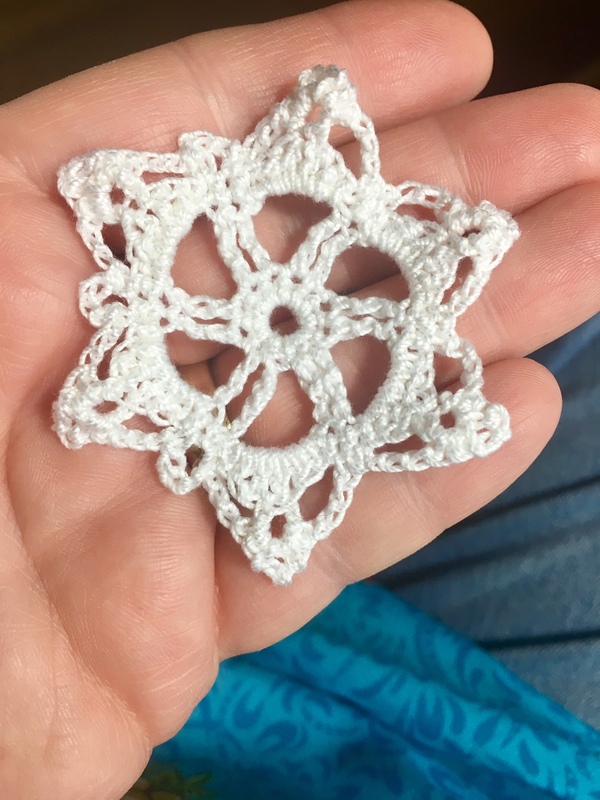 Crocheted snowflakes! 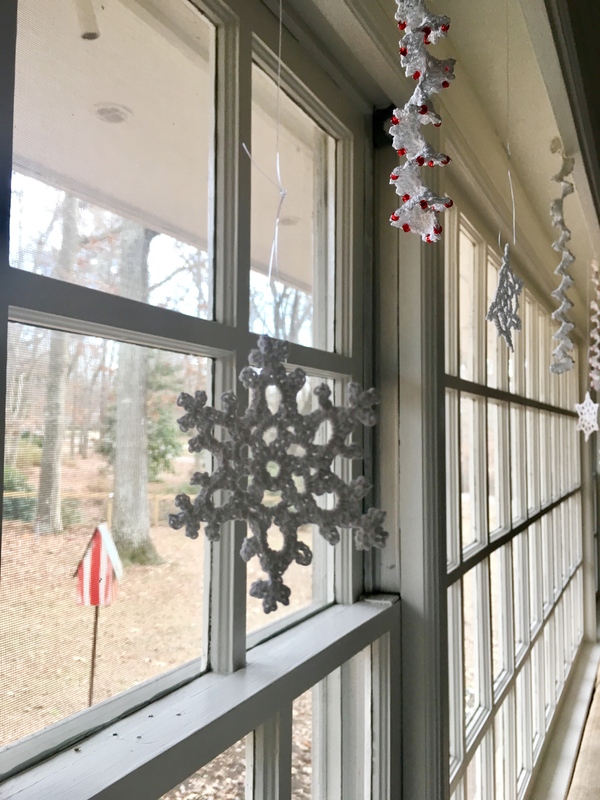 I purchased some of these charming snowflakes in the past at craft fairs in New Mexico. I previously hung them, with my particularly tall daughter’s help, from the sky light over our kitchen island. In our new house I needed a new way to display them. 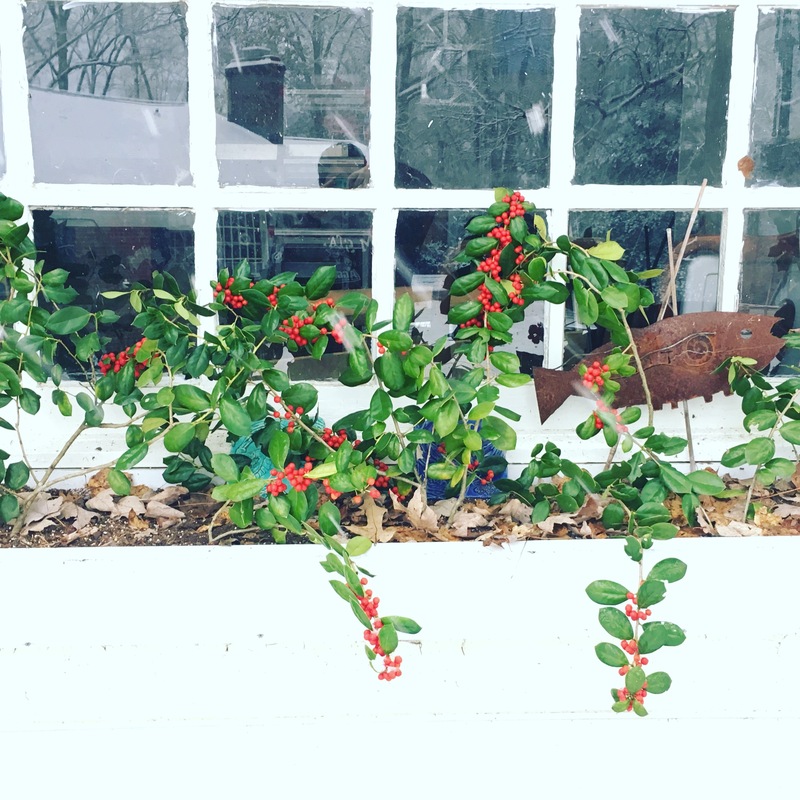 I decided to hang them from the window valance in our main living room. it has a large picture window and looks over our backyard. I had the perfect amount for that window. I hung them with command hooks and fishing line. They are so enchanting here. I really wanted to hang them from all our windows! But I didn’t have a source to purchase them here in Virgina. Now you must understand that I don’t really crochet.I’m really just a knitter. In fact I thought I was rather terrible at crochet. But I started researching for some patterns. I thought if I could fund some simple ones at least I’d give it ago. I came across this book on Ravelry, 100 Snowflakes. I was able to find it for purchase on Amazon and immediately ordered it. Much to my surprise its very well written. It has written patterns as well as charted patterns for each snowflake. There pictured steps of each crochet stitch in the beginning of the book for quick reference. The snowflakes are grouped by Beginner, Intermediate, and Advanced. I began with Snowflake #1 and have currently worked through Snowflake #48. I’m proud to say my crochet skills have grown as I’ve moved through the book. I’m using Aunt Lydia’s #10 crochet thread and a size US 6 crochet hook. This was an earlier one and I missed three of the loops in the final round. In order for the snowflakes to really shine they need to be blocked with starch. Starch is surprisingly hard to find now a days. I looked at both Target and Walmart. 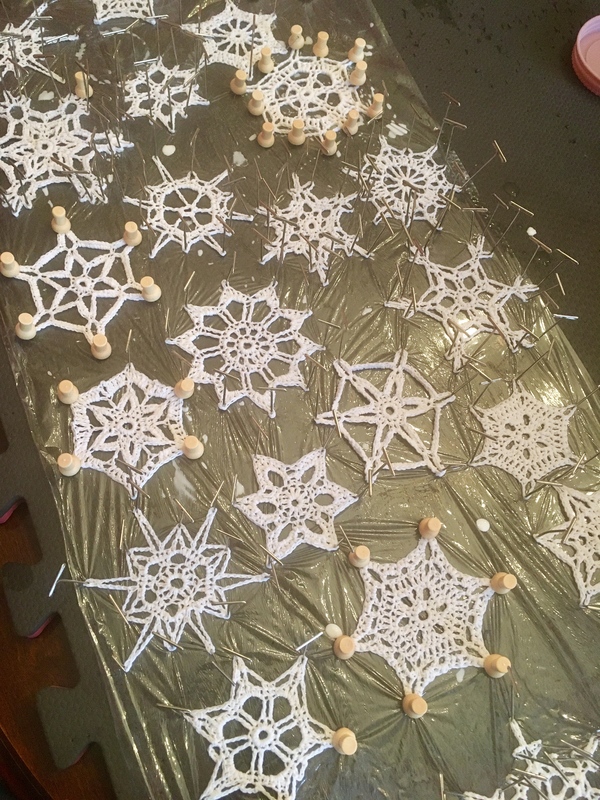 There was spray starch but I needed the liquid kind so I could soak each snowflake and then pin it out. Amazon to the rescue. I ended up ordering Aleene’s Starch from Amazon. This is the exact starch suggested in the book. Today I started blocking the snowflakes. It’s going to take a few rounds as I don’t have enough T-pins. I used some push pins put that doesn’t work as well since I can’t see the finer details because the pins take up more the visual space. It’s been fun and I want to make all 100! I’m not sure that will happen before this Christmas because I just purchased a Snowman pattern by Susan B. Anderson that I really would like to work on. Happy Knitting! Or Crocheting as the case may be. I haven’t had a true Fall for several years having been lost in a desert oasis. There aren’t many trees in a desert and it’s still rather warm this time of year. So, it’s basically just like the summer only a slight bit cooler, like in the 80’s instead of 90’s. This year it’s different. We live in a beautiful neighborhood with trees galore. Our neighborhood is named Queen’s Lake and we are in Williamsburg, Virginia with the leaves beginning to fall and the nights getting pretty cool now. I’ve always decorated pretty enthusiastically for Halloween. This is year was a little slower in that regard. I only just yesterday would say I finished decorating. Stevie and Hanna are both big fans of the Halloween time. Stevie got married on Halloween and her rehearsal dinner was a costume party. Which was really neat. I think I had a harder time getting in the spirit of the season since Hanna is in Oklahoma and Stevie is up in Alexandria. These girls always go big on costumes along with their respective men. And I really enjoy seeing their creativity. For me this year was a little sad, and anticlimactic, particularly because I don’t have my friends coming over every Monday to knit and share in the joy of a holiday theme. I try to invoke a witch atheistic. But, basically, a lot of my decorating consists of covering everyday stuff with spider web table cloths. Then I might throw in a pumpkin or two. This is a very simple thing with a big impact. I’ve been collecting the table cloths, table runners and such for a few years. I find them mostly at Target and Michael’s and I try to pick up a couple new ones each year. I always set up my “The Witch is in” spot. This is my favorite thing. It’s different each year but always includes this broom that I’ve had for probably 15 years. A nice big Daddy Long Legs, or whatever they’re really named. This year I added the old suitcase I found for a couple bucks at an estate sale a few years ago. The suitcase was living in my fireplace in the living room. My sister-in-law, Ruth, asked why I had a suitcase in the fireplace. I say, why not? Here’s the first level of Fireplace decorating I did when we moved into this house which included said suitcase. I thought it was charming. I really don’t like having and empty hole in the fire box. For the fall I changed this fireplace up a bit. We probably will have fires in this fireplace and not in the other one in the family room. I will change this again to allow for that when I decorate for the Christmas season. The bit of change was adding a old toolbox, cedar shavings and a few pumpkins to “Fall” it up. The big Pewabic tiles hanging over the fireplace have a fun story. You may know of my love of reading and of all things books. I also have a great big spot in my heart just for libraries, and specifically, the Detroit Public Library main branch building. The Friend’s of the DPL did a fundraiser a few years ago, coordinated with Pewabic Tile, to replicate the story themed tiles that are on the fireplace surround in the children’s room in the DPL’s main branch library. This is the library fireplace, These are original, one of a kind tiles, that were made for this fireplace. Following is are the two tiles above my fireplace up close. They are replicas with more contemporary colors that happen to suit my decor style perfectly. These are the “Steadfast Tin Soldier” by Hans Christian Anderson and” Midsummer’s Night Dream” by William Shakespeare. They measure approximately 11×14 but as they are individually handmade they vary slightly, adding to their charm. My brother made these frames using our wet bar counter. I have two other tiles from this fundraiser. but they currently are living with my brother. I think I should do a full blog post just on Pewabic and these tiles. It’s a pretty low key style with my Witch aethtic going strong. I left the burned out lightbulb to add to the effect, or maybe I just don’t have one to replace it with, whatever. These are some of the favorite bits. There’s more. Come on over and see. 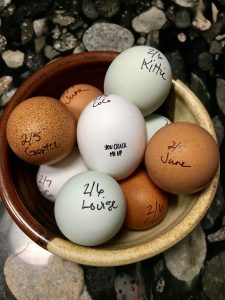 And you can grab a dozen eggs while your here. We have a few. A few dozen or so. I’ve also finished some knitting projects that need photographing and I’ll update those soon. Happy Halloween and happy knitting.